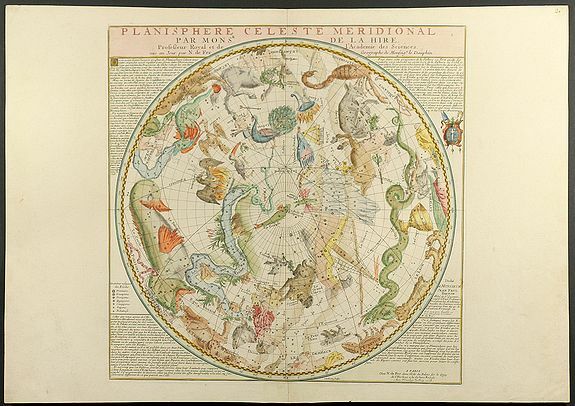 Title : Planisphere Celeste Meridionale (and) Planisphere Celeste Septentrional. Map maker : Fer, N. de. Size : 18.1 x 18.1 inches. / 46.0 x 46.0 cm. Description :Two separate charts of southern and northern Hemisphere according to Philippe de la Hire (1640-1714). Hemisphere with surround of text and engraved dedication to Jean Paul Bignon from Herman van Loon. Condition : Beautiful engravings on excellent paper, nice hand colour and wide margin. Outstanding conditions.